It seems like every brand is coming out with their own take on a contour palette, and Tarte is no exception with their new Tarteist Contour Palette. They even released a dual-ended brush to pair with their new palette. Since I don’t have a lot of experience with Tarte products (a problem I want to fix this year) I decided to give these two a try and see how well they perform. Because if there is one thing I love to do on the daily, it’s contour! The gold packaging is totally on point, wouldn’t you say? It makes these two items something you want to display on your vanity. I’m not as big of a fan of the circle shape of this palette, but there isn’t really a good reason for that except that it doesn’t sit with my other rectangle palettes as nicely. 😛 The closer snaps into place very firmly and the mirror is a very decent size to use when applying your face products. You’re also able to open this palette 180 degrees, so it can lay flat on your makeup table. Love that! As you can see from the swatches above, the highlight and the corrector shades are very nicely pigmented and feel so buttery soft. The center sparkly highlight shade is a bit chalky, not my favorite personally. The two contour shades and blush shades are also beautiful and work so well when blending out on the face. 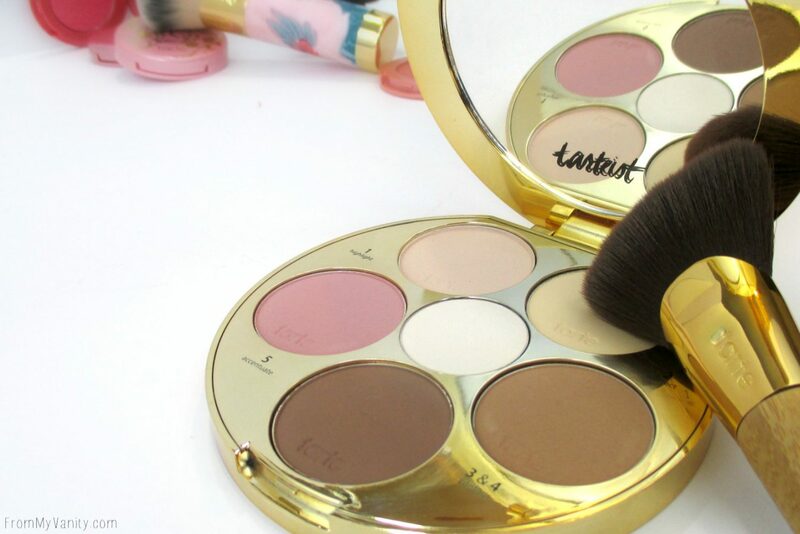 One disadvantage of the Tarteist Contour palette is that it’s best suited for light to medium skintones. If you’re much darker, I think you’ll have a hard time getting the colors to show up; especially that blush shade. Maybe they’ll eventually come out with different shade ranges, like Anastasia Beverly Hills did with her palettes, but for now it really only caters to a certain group of gals. The most annoying/frustrating aspect of this palette were the size of the pans. 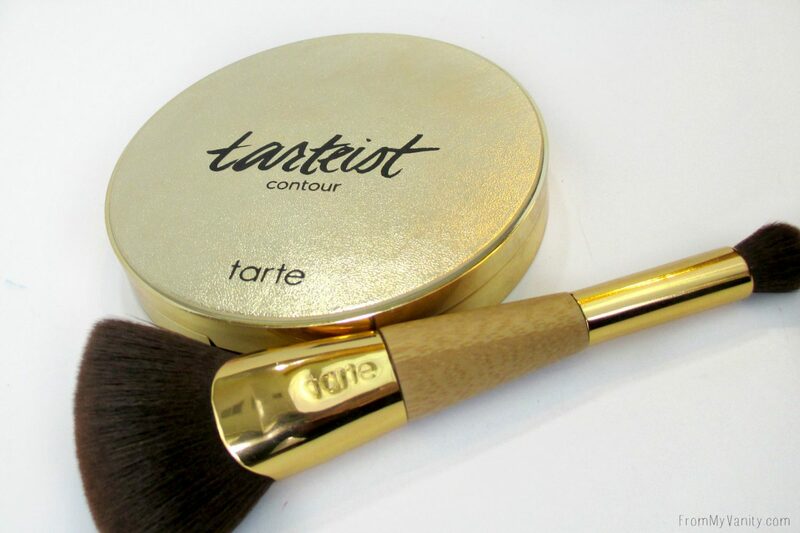 Since they were circular, I found it very difficult to get the larger end of the Tarteist Contour Brush to pick up the color across the whole brush. I would have to dab one side, and then the other before going onto my face. Which resulted in a very messy-looking palette! So, depending on your personal preference, that may or may not bother you. I am not a fan of dual-ended brushes because I can’t stick them in my cups with the other brushes. So a dual-ended brush has to be pretty fantastic in order to stay in my brush collection. And this brush earned a spot! 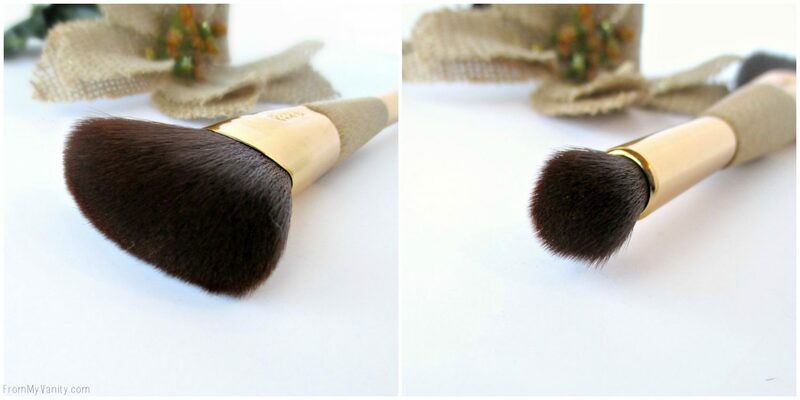 Compared to other flat contour brushes that are meant to really chisel out the cheekbones, this is by far my favorite. Because of the shape you’re able to get that sharp line, but it’s so densely packed that it takes little effort to blend it out to a natural appearance. Which is the type of contour I prefer. The other end is also great, though I don’t use it as much. If you contour your nose, though, this is perfect! 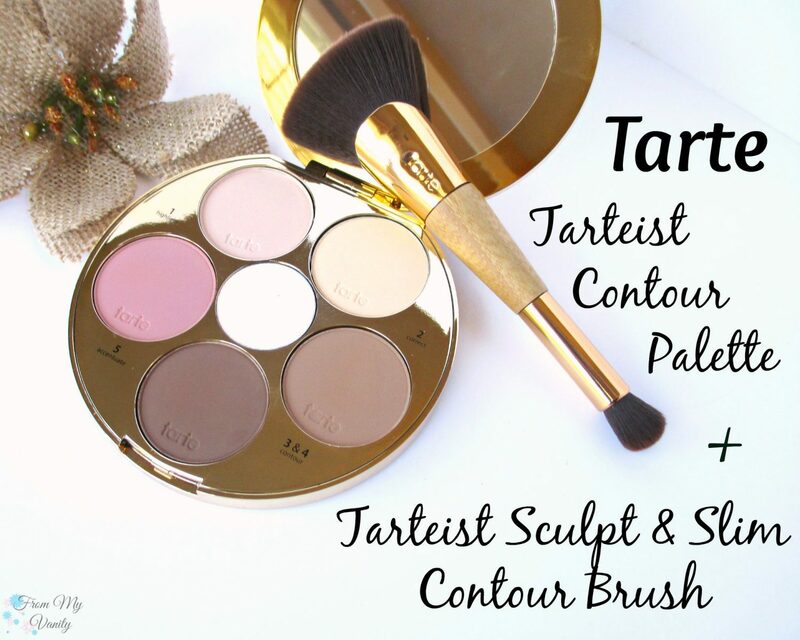 Have you tried either the Tarteist Contour palette or brush yet? Which contour palette is your favorite and you recommend I get and try out next? Let me know in the comments below! The products mentioned above were purchased with my own funds. I was not compensated in any way for writing this post. Affiliate links are used. All thoughts are 100% my own. Tarte really is a master at packaging! This looks really nice. They have some new products coming out that intrigue me a lot too. I know, I am drooling over their newest releases. So, so tempted….! I’m loving the look of the brush! I store dual-ended ones in drawers so they lie flat. I love the packaging of the palette, but as you said, some of the shades look a tad pale for me. Gorgeous palette and I love the brush!!!! I certainly need to check this out on my next Ulta trip. Contouring is so foreign to me but maybe a palette like this would help ease me in! I know, gold packaging always catches my eye! Double ended brushes are always such a nice piece to have! I have several and use them all so much! I love the look of this palette, but the circle pans for some reason just threw me off. I agree with you about the brush size, the pans seem to small for the brush!?!? I LOVE the Kat Von D Contour Palette!!! Yes, I wasn’t too excited about the circle pans, especially when they release a brush like that to pair with it. It just doesn’t work! But when I used my Real Techniques contour brush, it fit nicely into the pans. 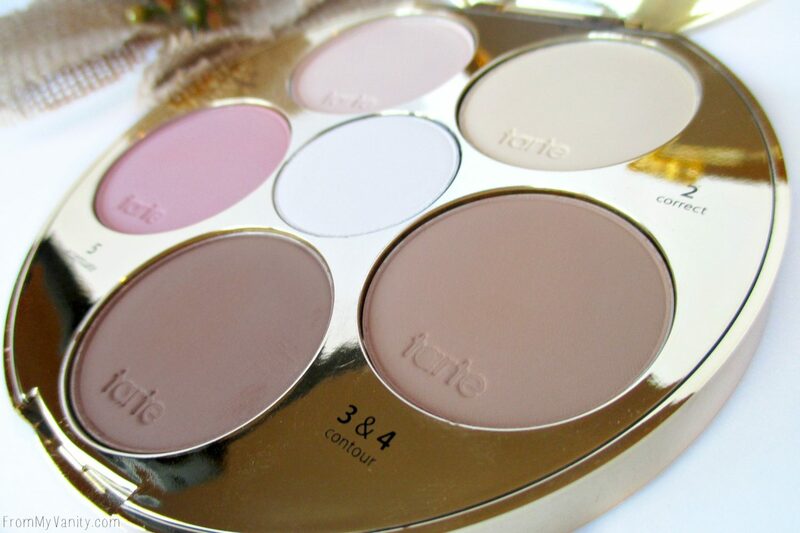 This is a gorgeous looking palette! I might have to see this in person. How does this compare, color-wise, to other contour products? I honestly can’t say how it compares, I don’t own the Kat Von D, LORAC, or Anastasia Beverly Hills one. It’s on my bucket list for this year, though! Oh I had never seen the brush before, that looks so cool! I love the brush! Use i whenever I really want to chisel out my cheekbones! Great review! I haven’t tried these two products but I wonder if the brush can be purchase the brush separately. This actually looks really nice! I like that it includes a blush and corrector shades.